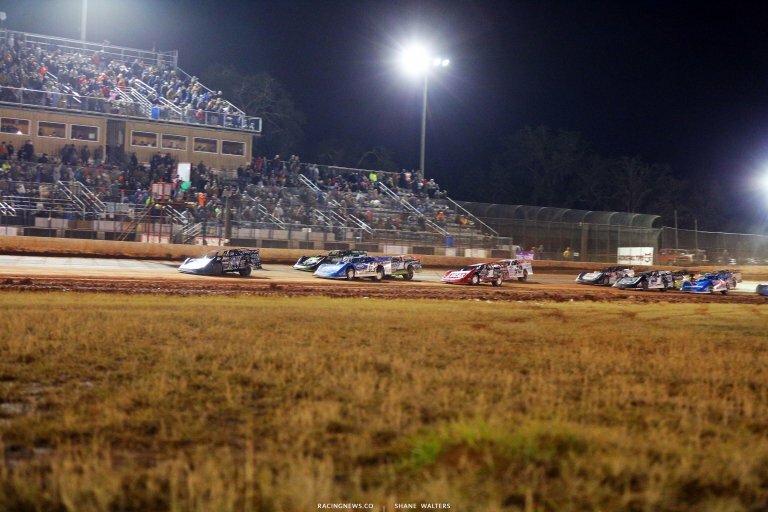 View full 2019 Super Bowl of Racing results from Golden Isles Motor Speedway below. Just as hot laps were concluded, the rain returned. We went under a multi-hour delay. Just after 9pm, the show has now resumed with a new round of hot laps. 14.914 for Earl Pearson Jr in group A qualifying. 15.059 for Jonathan Davenport in group B.
Earl Pearson Jr and Brandon Sheppard set the front row for the first heat race. Green, Pearson noses ahead on the bottom lane. Bloomquist follows him through. Sheppard falls to 3rd. Bloomquist is looking low on Pearson off turn two. They run side by side. Lap 2, they’re even into turn three. Pearson lifts first on the outside. Bloomquist is through on the bottom. Lap 6, slow car on track. The caution is out. Green, Bloomquist is clear by 3 car lengths at the flag stand. He’s driving away. Bloomquist wins the first heat race of the night at Golden Isles Speedway. Josh Richards and Ryan King trail the pace truck ahead of heat race number two. Green, Richards gets the jump. Richards drives it two feet deeper on the bottom. Hudson O’Neal has to check up mid corner behind King. Lap 5, Dennis Erb Jr is showing some speed. He’s on the bumper of King for 2nd. Josh Richards drives off to win heat two by over 10 car lengths. Jonathan Davenport and Jimmy Owens lead them off turn four in heat three. Green, Jason Fitzgerald has a run from row three. He pulls even with Don O’Neal as they rum three wide for 3rd into turn one. They ran out if space. O’Neal went around in front of the field. He did a 360 and got hit on all four corners. The corner worker pulls out the fenders and he’s good to go again. Green, Owens and Davenport run even into turn one. Davenport lifts on the bottom. Owens drives around on the top. O’Neal has a run on Davenport off turn two. He looks to the inside in turn three. Still side by side into turn one. O’Neal lifts on the bottom. Lap 8, car around off turn four. The caution is back out. Green, Davenport spins the tires down the front stretch. Owens opens a gap. Jimmy Owens takes the win in heat three. Tyler Erb and Chase Junghans line up on row one for the final heat race of the night. Green, Tyler Erb leads on the bottom. Jeff Mathews follows as Junghans drops to 3rd. Erb is driving away. Junghans is all over Mathews for 2nd. Lap 7, Junghans completes the pass. Erb is 10 plus car lengths up the road. Tyler Erb takes the win in the final heat race of the night! It’s and all Tennessee front row for the Super Bowl of Racing. 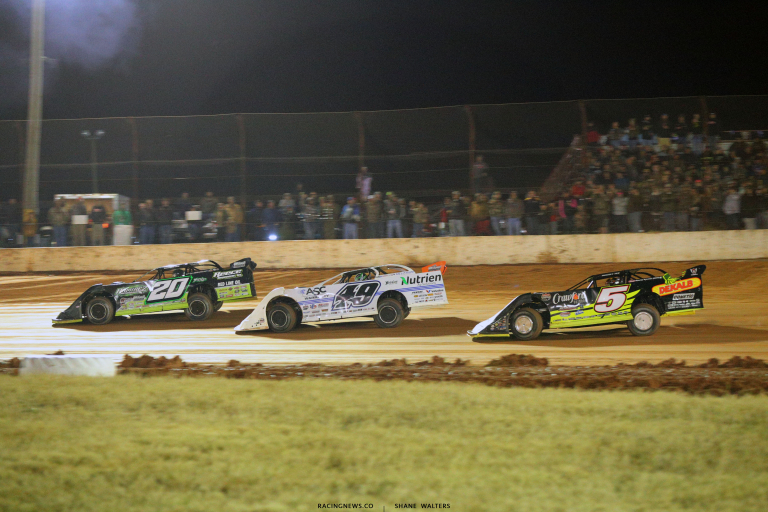 Scott Bloomquist and Jimmy Owens lead them to the flag stand. Green, Bloomquist is clear by two into turn one. Owens heads for the top of the track. He’s on the gas hard. Owens has a run. He’s on the right rear of Bloomquist off turn two. They run even into turn three. Owens gets the drive off the corner and takes the lead! 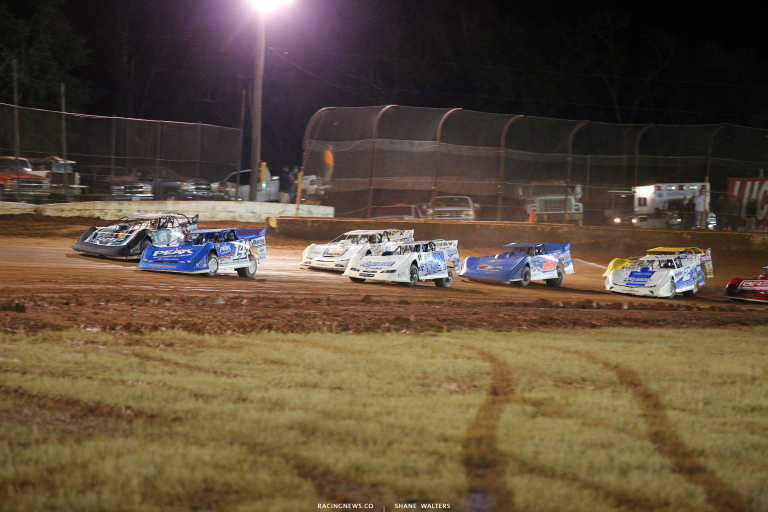 Lap 2, Brandon Sheppard and Ryan King fight for space in turn one. King is around. Kyle Bronson and more are collected. The caution is out. Green, Richards is on the move in the outside lane. He takes 2nd from Bloomquist and sets sight on Owens. Lap 5, trouble for Hudson O’Neal. He heads to the pits. The caution is back out. 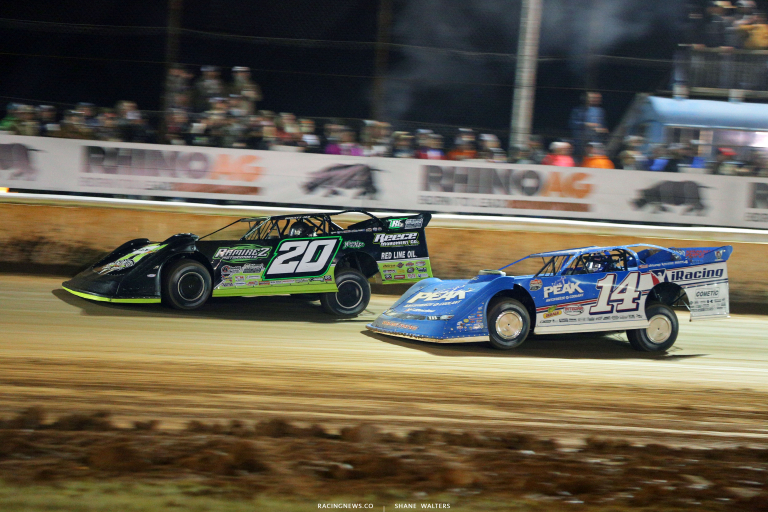 Green, Bloomquist heads to the bottom. Richards runs the middle and Owens is up top. They’re three wide in turn one. Owens leads off turn two. Bloomquist and Richards are side by side into turn three. 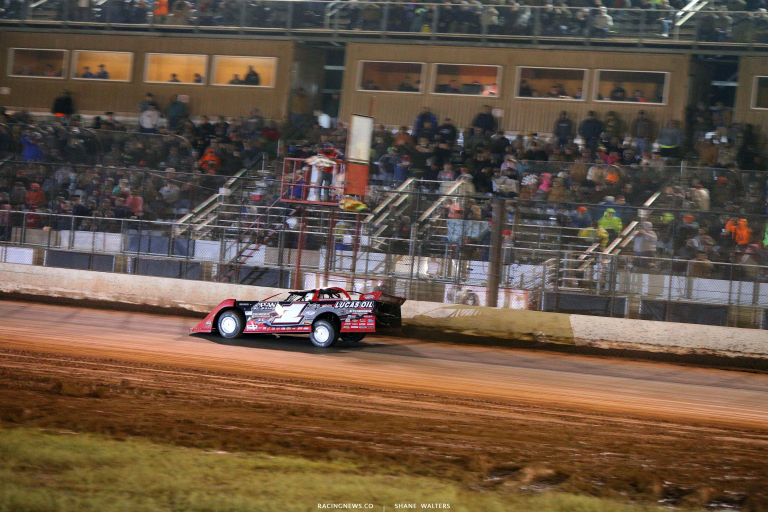 Bloomquist drives it deep on the inside. He clears him down the front stretch. 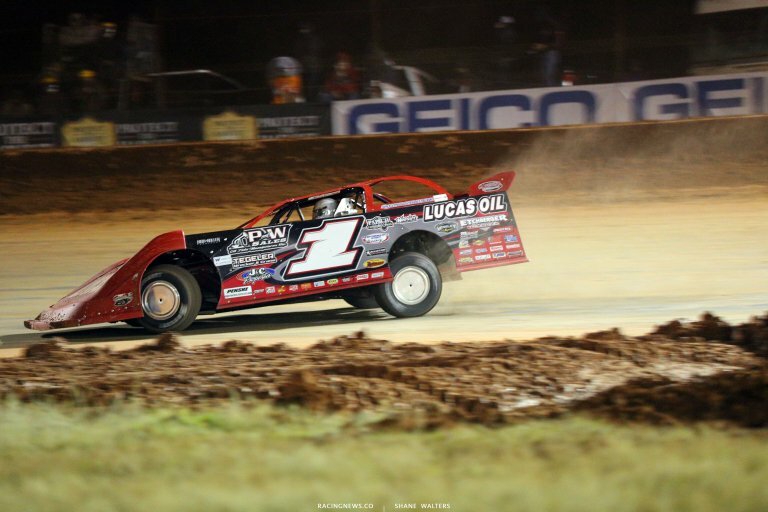 Bloomquist is on the bumper of Owens. He cuts to the bottom. They’re side by side for the lead. Several laps later, still sids by side. 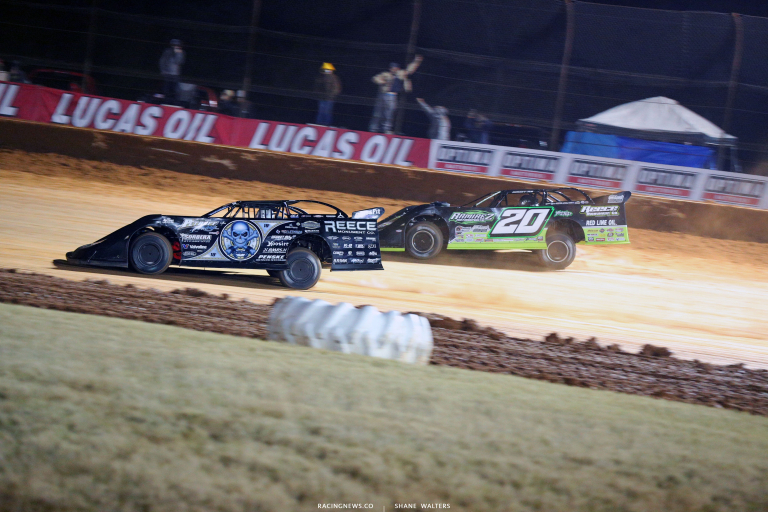 Bloomquist drives deep to the bottom and noses ahead. He slides up the track a bit and clips Owens. The #20 car is around in front of the field. Josh Richards comes along with nowhere to go as they make nose to nose contact. The caution is out. 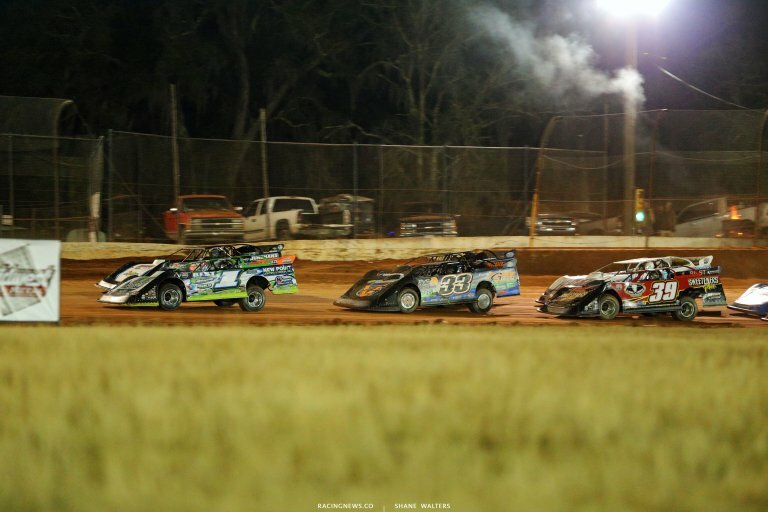 Green, Bloomquist is driving away. Lap 20, Bloomquist leads Pearson by 10 car lengths. Lap 25, Bloomquist is pinned behind a lap car. Pearson and Davenport close to his bumper. The lap cars part and Bloomquist opens a gap. Lap 32, Pearson is back on the bumper of the leader. He looks high in turn one. 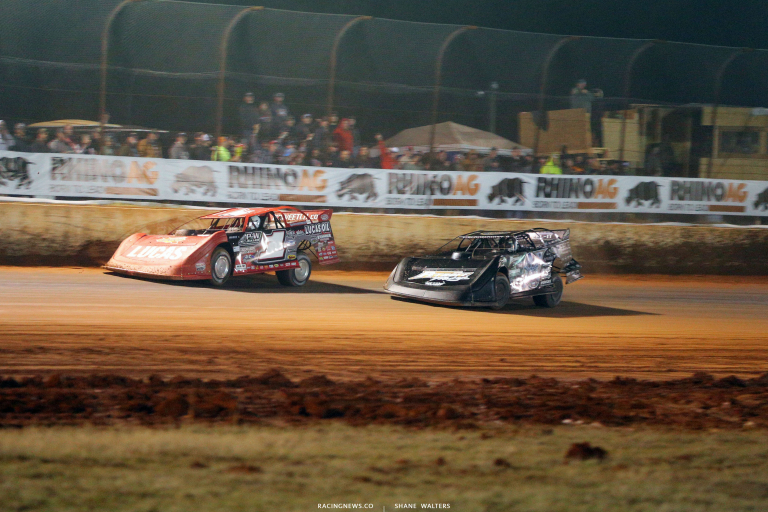 He squeezes between Bloomquist and the wall off turn two. Pearson to the lead! Lap 37, Owens is slow. The caution is out. Green, Pearson opens a gap. 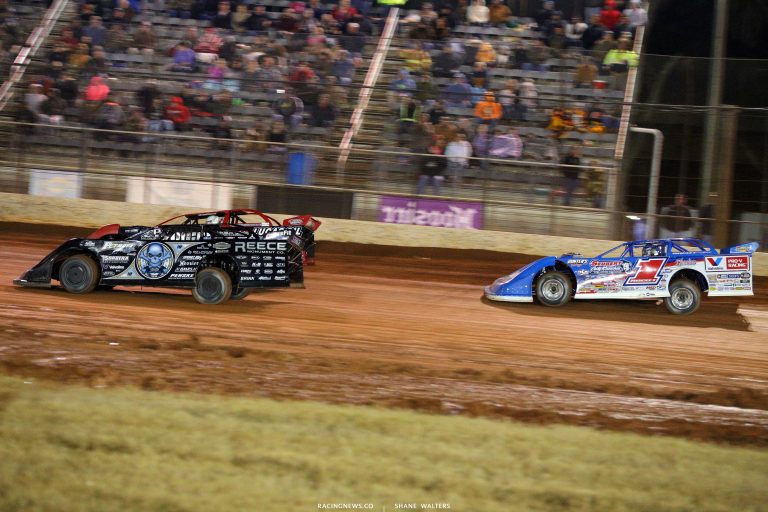 Bloomquist and Davenport battle for 2nd. Pearson drives off to win the Super Bowl of Racing at Golden Isles Speedway!